The chart above shows the price of bitcoin, a so-called cryptocurrency. 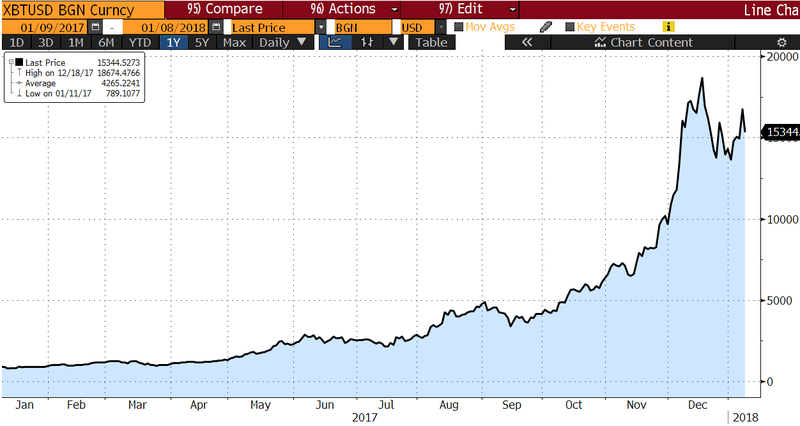 Bitcoin has been appreciating for several years, but it has exploded during the last 12 months with a performance of 1600%. During the last 5 years Bitcoin has gained a staggering 10900% versus the USD. Bitcoin is a digital currency created in 2009. It follows the ideas set out in a white paper by Satoshi Nakamoto, whose true identity has yet to be verified. Bitcoin offers the promise of lower transaction fees than traditional online payment mechanisms and is operated by a decentralized authority, unlike government-issued currencies. Bitcoin is a type of cryptocurrency: balances are kept using public and private “keys”, which are long strings of numbers and letters linked through the mathematical encryption algorithm that was used to create them. As of December 2017, there were 16.78 million bitcoins in circulation, so the total market value of bitcoins was $257 bn. (It is the same market cap of companies like Nestlé and AT&T.) US currency in circulation (coins and notes) was $1612 bn, the aggregate money supply known as M2 was $13800 bn, as of the end of 2017, and the Bloomberg World Market Cap was $83424 bn, to put a perspective on the bitcoin size. On 11-Dec-17, the CBOE launched the first future contract on bitcoin (the CME did it also one week later), somehow recognizing the importance of this new “financial asset”. Daily volume of the two exchanges amounts to $58 million. In a world where central banks are running a very expansive monetary policy and, so, trying to debase their currencies, some investors perceive that bitcoin will hold the value as there will be a maximum of 21 million bitcoins and every year only a small amount of bitcoin can be “mined”. Somehow bitcoin might be a “digital gold”. Protection from payment fraud, as the payments must be confirmed by many. Direct transfers for immediate settlement. Bitcoin contracts can be designed and enforced to eliminate or add third party approvals. Access to historically inaccessible markets: There are approximately 2 billion people with access to the internet who do not currently have access to traditional exchange systems. Lower transaction fees, as bitcoin miners are compensated by the network with newly created bitcoins. WHY DO PEOPLE THINK BITCOIN IS VERY RISKY? Bitcoin can never be a currency or means of payment with this level of high volatility (86% volatility with daily observations last year), meaning that bitcoin price changes 5.3% on a daily basis. The cost (mainly electricity) to “mine” a bitcoin is around $3000 to $4000. Bitcoin price at $15334 is very far from “marginal cost of production” if we were to use a well-known valuation methodology for other assets. Some believe the appeal of bitcoin is that it can be used anonymously for illegal acts. It is not a well-regulated asset, so some questions may arise in terms of applications, security, etc. Many people (including this humble writer) do not understand how to value a bitcoin, as there is no yield (bonds, equities, real estate) nor comparable purchasing power (currencies). In September, JPMorgan Chase CEO Jamie Dimon said: “it is worse than tulip bulbs. It won’t end well. Someone is going to get killed”; “it is a fraud”; “it is just a real thing, eventually it will be closed”… When he said this on Sep 12th, bitcoin was trading at $4200. In January 2018, Merrill Lynch banned its clients, advisors from trading bitcoin related investments. (CNBC). It is difficult to have an opinion on bitcoin, as apparently less well-informed investors or/and speculators are piling up on bitcoin, whereas “savvy investors” are staying away from it and even calling it a fraud. Blockchain, the technology behind bitcoin, is well accepted by everybody and it is here to stay and to be used in many other areas. There are thousands of bonds, shares, currencies and commodities in the market that we can understand and value reasonably well, whereas this writer is unable to give a value to bitcoin (neither positive nor negative), so DO NOT TOUCH the assets that you do not understand. Next LUXE : un investissement attractif ?